Paula Jean Bainbridge was born on July 12, 1951, in Waterloo, Iowa, daughter of Cecil and Mary (Charlton) Scarbrough. She graduated from West High School in Waterloo in 1970. After graduation she met Glen Bainbridge and after a lengthy courtship they were married on April 12, 1994 at Christ Lutheran Church. Paula worked at various nursing home and senior care centers as a nurse’s aid and really enjoyed working with seniors. She was a free spirit and very outspoken about her feelings. She loved to party in her younger years. Paula and Glen travelled to locations including San Francisco, Las Vegas, Reno, and the Caribbean. They also enjoyed watching movies together. She enjoyed home decorating and was known to vacuum and rearrange furniture at all hours of the day and night. She also enjoyed shopping – especially for purses and shoes – and hosting home parties. Paula passed away on Wednesday, January 7, 2015 at the Allen Memorial Hospital Emergency Room at the age of 63 years. 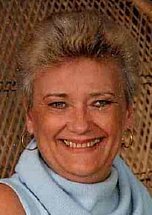 She is survived by her husband, Glen of Waterloo; their dogs, a Dalmation named Douglas and a Border Collie named Sparky; four brothers: Terry (Sue) Scarbrough of Hudson, Tim (JoAnn) Scarbrough of Minnesota, Jeff (Jolene) Scarbrough of Evansdale, and Dennis Scarbrough of Waterloo; and two sisters: Christine (Ray) Brandt of Davenport and Meri-Jo Scarbrough of Evansdale. Paula was preceded in death by her parents and a twin brother, Paul Dean Scarbrough who died in infancy.